A slice of lasagna on a plate with a fork on a red and white checkered table cloth. The plate also contains a side salad. 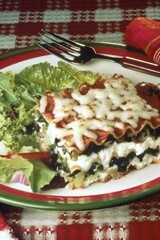 The lasagna is made with spinach (as a substitute for meat), whole wheat pasta and low fat cheeses. This was a poster in "The Healthy Eating Tips" series.